If you conjure an image of a leader, you will likely envision a man in a suit, maybe at a podium or in a boardroom. But the person who taught me about authentic leadership prefers a feathered cap and sparkly pants. Gord Downie, lead singer for the Tragically Hip, is the most energetic and mesmerizing person I have ever watched on a stage. So it seems almost impossible that this lightning rod poet singer could ever be trapped in a mind and body that may not be able to find a way to keep living. I was a music publicist in my early professional years. My job was to market a band’s upcoming record or tour to the media. My “swan song” before I left music to become a financial planner was to help get the Tragically Hip’s record, Phantom Power, ready for release. Despite the fact that they were halfway through their career, they were new to the label I worked for, Sire Records. They were well-established in Canada, had appeared on Saturday Night Live, and REM had opened for them on their previous tour. Also wildly popular in the northern United States, they had not fully broken across the states. To help us “get” who they were as a band, they came to play for us in the office kitchen. We sat with jaws dropped and ears pinned back as Gord sang, screamed, danced, gyrated. For just twenty of us. In the kitchen. The confidence, charisma, and control that Gord had over that room was palpable, and it was clear that he was a born leader. While no subsequent show could match the intensity and intimacy of my introduction to the band, I did see them play many more times in various cities with my husband, a Canadian by birth, and one of their biggest fans. (Truth be told, I think the retelling of the kitchen Hip show is why he married me.) Which brings us to last summer. Gord announced that he has incurable brain cancer, and it was time for a final tour. Fifteen shows in Canada, a tribute to both the band and the fans that fed each other with admiration and energy for three decades. It was a somber night as we sat on our couch to watch a live telecast of the final Hip show in Kingston, the last of the tribute tour. If you want to know the magnitude of this event to Canadians, the prime minister attended the show. The Toronto Police tweeted: “Dear World, Please be advised that Canada will be closed tonight at 8:30 p.m ET. Have a#TragicallyHip day.” And in cities across Canada, “town square” areas were consumed with building-to-building Hip fans. They were just there for the Hip, as the Hip had been there for them all of these years. 1. Leave it all on the stage, and leave them wanting more. Through the very last note that he sang with The Hip, Gord gave all of himself as a performer on the stage. And in the end, he always left the audience wanting more. At every show, the fans would have stayed for as many hours as Gord would have given them. For every tour, tickets were snatched up as soon as they went on sale. And in the last tour of his lifetime, even stadium venues were not large enough to hold the thousands of people who wanted to see him perform One. Last. Time. People look to their leaders to inspire them, to take action and to show confidence, and leaders will be remembered for the results of their actions, rather than inactions. It would have been really easy to send out a press release that Gord had cancer, the band’s days were over, and that he was going to spend time with his family and safeguard his health. Instead, they lined up tour dates, a final salute to their fans and to Canada. Hard choices often require hard answers. Leaders embrace those opportunities, and summon the courage to push forward against adversity where others may falter. And courage challenges us to take the harder road, rather than the easy way out. 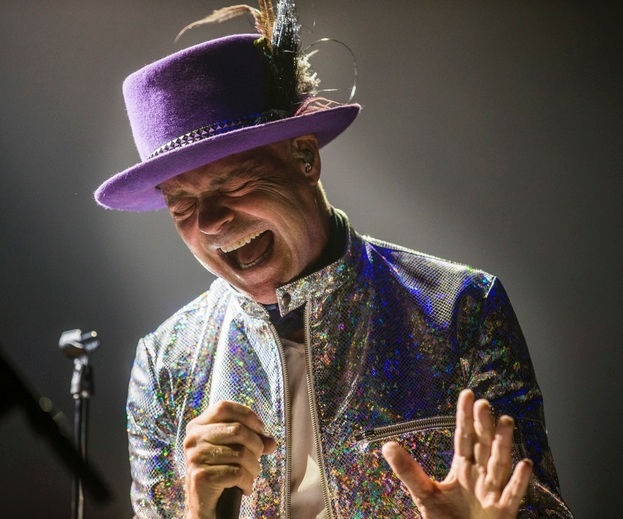 Gord’s lyrics cover everything: young love, faded love, loss, life, death, business, kids, music, hockey, Shakespeare, world wars, murder, wrongful imprisonment. Gord is a poet who delivers his work through music and acting out characters on a stage in front of eager fans. It was this pure humanity that made Tragically Hip concerts an event, as evidenced by the many 1-2 night sojourns my husband has taken to meet friends for the first or last (or any) night of the tour in Chicago, New York, Toronto. A leader’s message must be clear, concise and captivating, or it will have no effect. Words and actions will either inspire coworkers, clients, and colleagues to join in and help, or they will go in one ear and out the other. The Tragically Hip was together for more than 30 years, which is the rough equivalent in band years of a marriage lasting 70 years. And as with a marriage, I am sure there were plenty of spirited moments along the way. Gord clearly had a vision, but he couldn’t do what he does best without the band. You can be a leader through sheer force of will, but this is not enough to inspire long-term loyalty. Having the grace to include and involve followers in the process, and to treat employees / team members / bandmates as equals, leads to greater success, longevity, and loyalty. Gord was born to be a lead singer. While he was defined as a singer, it’s the “lead” part that he did so well. He led his band through a career, he led his fans in celebrating life and music, and he led his country in saying goodbye to him as their singer poet. July 1 is Canada Day. It may just be another day in your house, but it’s cause for celebration in our house, as we honor Gord Downie, who is still teaching us through his efforts to help others, and recently received the Order of Canada. For more blogs and articles on personal finance, the financial markets, and how your money and choices can help you create the life you want, sign up for our blog by sending an email with the word “Subscribe” here: [email protected].